Belgian underwater repair specialist Hydrex says it is carrying out more modifications to a ship’s underwater areas and equipment in addition to the company’s more common damage rectification work. The increase in this type of work - to propellers, in particular – follows the recent introduction of the European MRV regulation which has seen more shipowners look at ways of further reducing fuel consumption (and emissions) when operating to and from European ports. The EU MRV (Monitoring, Reporting, Verification) regulation entered into force in July 2015. It mandates shipowners and operators to monitor, report and verify CO2 emissions for vessels larger than 5,000gt calling at any EU and EFTA port. Data collection requirements became effective on a per voyage basis in January 2018. One way of saving fuel is by operating at lower engine speed. But this can detract from the ship’s overall efficiency because propellers are generally optimised for a certain rotational speed. An example of the company’s performance-enhancing upgrade work was a recent project carried out on a 229m long bulk carrier berthed in Bremerhaven. In this case, the bulker’s five-bladed propeller was modified to achieve optimum efficiency at lower speeds. “A major benefit of this approach is that the work is carried out rapidly without the need to take the vessel out of service for drydocking, which is costly in terms of both time and money,” said Hydrex Production Executive Dave Bleyenberg. Hydrex engineers are able to carry out underwater repair, conversion and modification work anywhere in the world, in any weather conditions, even in ice. “Extreme winter conditions will not prevent our divers from providing the services required,” added Bleyenberg. Fuel savings, although important, are not the only reason to carry out propeller modifications while ships are afloat. A further case study shows that after several ice-going vessels suffered propeller damage due to harsh winter conditions, resulting in the blades needing to be cropped, the customer was keen to reduce the risk of his other container ships suffering similar damage from ice and other debris in the future. Before the next winter season, during which equally harsh conditions were expected, Hydrex engineers carried out a modification programme, altering the blades to a very specific design which would make them less prone to damage, while having a minimal effect on the overall efficiency of the propellers. This was undertaken in close cooperation with the propeller manufacturer. Such modification tasks are an addition to the normal portfolio of Hydrex underwater repairs. 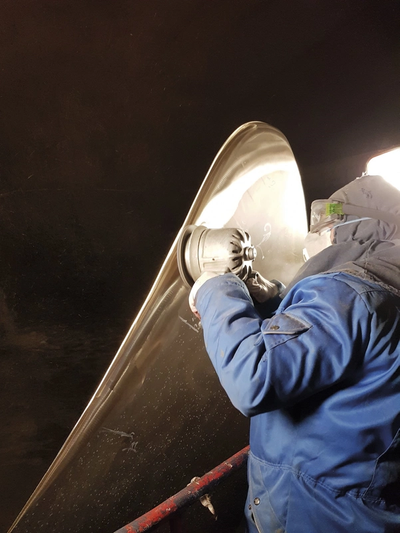 “We can offer you the best possible solutions when propeller blades are damaged after impact with ice and debris, even when the damage is quite extensive,” said Bleyenberg. In these circumstances, Hydrex typically uses its propeller blade cold straightening technique. Should a piece of the blade be broken or if there is other damage too extensive for straightening, a section of the blade will be cropped. In either case, the work is carried out using equipment developed in-house by Hydrex’s own design engineers. Neither repair will require the vessel to be drydocked, enabling normal commercial operations to continue with the minimum of delay.